L to R: Esther Allen and Alison Griffiths are among 173 scholars, artists, and scientists chosen from almost 3,000 applicants awarded 2018 Guggenheim Fellowships. 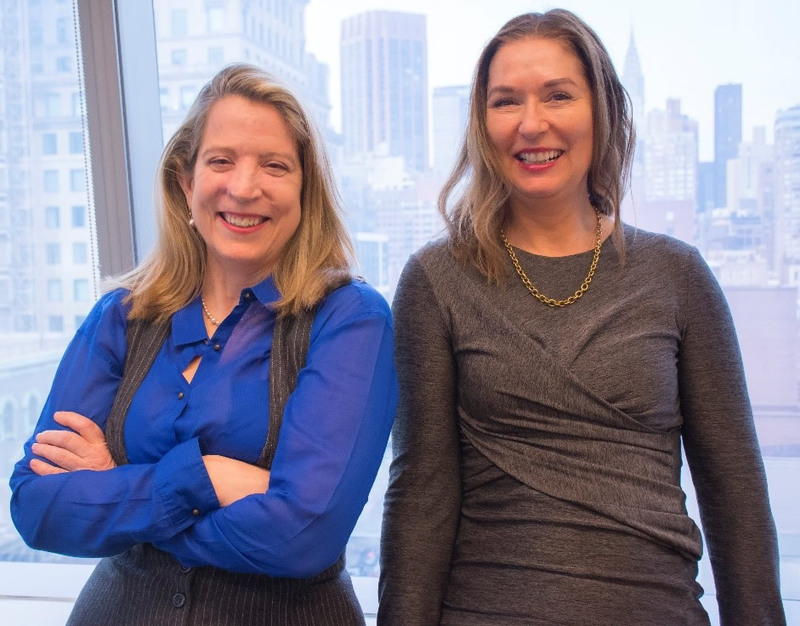 New York, NY, April 10, 2018 – Esther Allen, PhD, and Alison Griffiths, PhD, faculty members in the George and Mildred Weissman School of Arts and Sciences at Baruch College, were each recently awarded renowned 2018 Guggenheim Fellowships. Dr. Allen, a professor in the Department of Modern Languages and Comparative Literature, was named a fellow for translation, while Dr. Griffiths, a professor in the Department of Communication Studies, was named for Film, Video, and New Media Studies. Both are the only candidates selected in their respective categories. The professors are among 173 scholars, artists, and scientists chosen from almost 3,000 applicants on the basis of prior scholarly achievement and exceptional creative ability in the arts. This year’s class of fellows represented 49 scholarly disciplines and artistic fields, 69 different academic institutions, 31 states, and three Canadian provinces. The John Simon Guggenheim Memorial Foundation started the renowned competition in 1925. The Guggenheim Fellowship will allow Allen to complete the translation of two novels by the Argentinian writer Antonio Di Benedetto (1922-1986): The Silentiary and The Suicides. Allen has already translated Di Benedetto’s Zama, today considered a classic, which took her seven years to translate and publish. According to Allen, Di Benedetto was named a Guggenheim Fellow in 1973, and shortly after was imprisoned and tortured during Argentina's Dirty War. Eighteen months later, he emerged through the efforts of a group of writers and activists who used the Guggenheim Fellowship and other awards he had received as evidence of his international importance. Allen believes translating books is a peculiar vocation that is similar to acting. Rather than using the body as a form of communication, a translator utilizes their mind and language as a form of self-expression. Dean Romero noted that Allen’s work cannot be done mechanically, but is a complete art. “To do this work very well requires a lot of study and being multi-cultural to see all the different background behind the author and the public at a time,” explained Romero. Griffiths will use her fellowship to write a book titled Nomadic Cinema: A Cultural Geography of the Expedition Film, which will examine expedition filmmaking from the mid-teens through the late-thirties during the 20th century. Focusing on films shot in Borneo, Central Asia, and the American Southwest, Nomadic Cinema will look at internationally recognized organizations and privately funded anthropological research trips, including four distinct 20th-century expeditions, some famous and others less known. Watch Video: See this video to hear Dean Romero and Professors Allen and Griffiths discuss the importance of receiving a Guggenheim Fellowship. Ranked #1 for social and economic mobility among its students, Baruch College provides graduates and undergraduates with the skills, knowledge, and perspectives to pursue their aspirations in today's global environment. Part of The City University of New York (CUNY), Baruch also ranks among the nation’s top public colleges for academic excellence, affordability, and value. Its three schools educate more than 18,000 students, representing one of the nation’s most diverse college campuses. Strong career and support services drive Baruch’s national recognition as an engine for social and economic mobility. Through executive education, continuing studies, international partnerships, public events and arts programming, Baruch stands out as an intellectual and cultural resource for New York City and the world. Visit baruch.cuny.edu.